Hiya guys! The flu bug hasn't quite wanted to let go of me yet so I've been a bit sluggish getting my posts done. Sorry guys :( But I'm definitely more than making up for it today with this massive collection from Daily Hues Lacquer. Today I'll be sharing swatches for the Blurple Garden Spring 2016 Collection, which consists of 14 polishes! Because of the size of the collection, I'll try to keep this review simple and to the point. Fair warning, this post has lots of photos ahead. The Blurple Garden Collection from Daily Hues Lacquer will be available for purchase March 1st. Currently there is a pre-sale available for those interested in purchasing the entire collection for a discounted price. 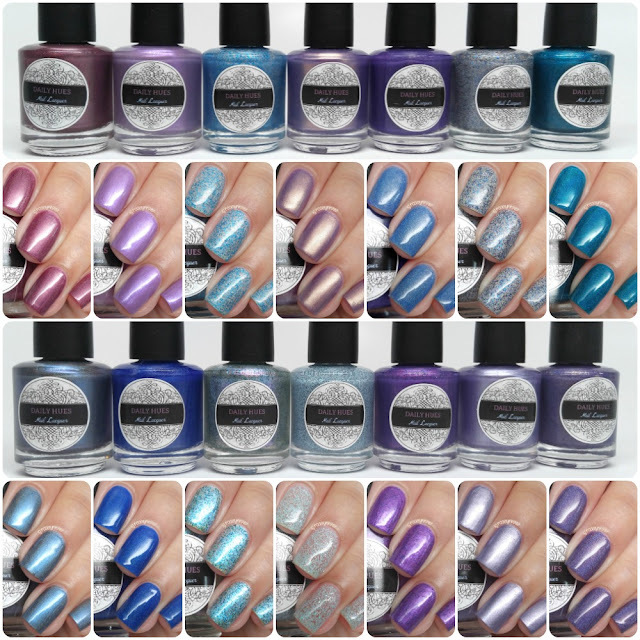 On release, each polish will retail between $8.25 to $11.50 per full-size. Now let's go ahead and get started. Rose can be described as a burgundy wine linear holo. Okay starting the review off with one of my favorite picks! I actually designed this beauty with Jenn and she really made my vision come to life. The formula and consistency are really smooth and the layers build up perfectly. Shown here in two coats and sealed with a glossy topcoat. Bellflower can be described as a muted purple with purple shimmer. The shimmer really brings this shade to life! Smooth formula, very minimal brush strokes. Shown here in two coats and sealed with a glossy topcoat. Baby Blue Eyes can be described as a linear holo base with baby blue crystal glitters throughout. Definitely another favorite of mine, this glitter is so darn sparkly! This shade can be used as a topper or can achieve a fully opaque finish in three coats like shown here. Pansy can be described as a muted purple with a gold shift. I didn't initially think I would love this one, but the shade is just so unique and beautiful. It had noticeable brush strokes after two coats so I decided to sponge on an additional third layer. It dries to a satin/matte finish on its own so that's how I left it for these swatches. 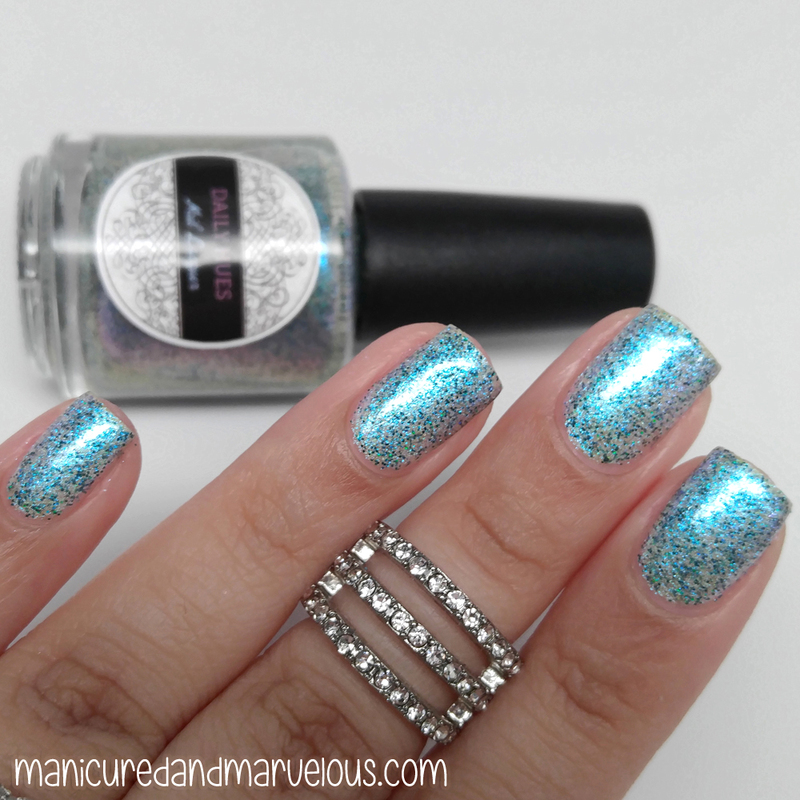 Nelle can be described as a royal purple to blue holo thermal! Close fans of Daily Hues might find that this polish looks familiar and that's because it is a comeback shade. However this classic thermal has now been made into a holo for the spring release! The formula has a jelly-like application and builds up really nicely. The transition is flawless and triggers easily with slight temperature changes. For these swatches, I used cups of water to trigger the transitions. Shown here in two coats and sealed with a glossy topcoat. Delphinium can be described as a micro silver holo glitter with metallic blue hexes. Another definite favorite here, I love the glitter combination in this one. Super eye-catching! This is a full-coverage glitter polish on its own, but can also be used as a topper. 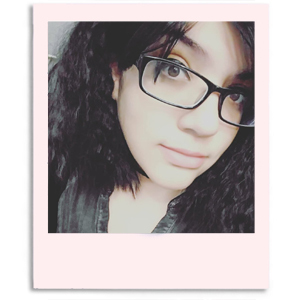 The application was really smooth and manageable for me without the need to sponge on any layers. Shown here in three coats and sealed with a glossy topcoat. Lily of the Nile can be described as a teal blue rich linear holo. Favorite alert! My swatch really does this shade no justice, it's so gorgeous. It has such a strong holo finish (my photos are taken in a lightbox) in person. Again, like the other holos in this collection this shade shares a similar formula and application. And no staining, woohoo! Shown here in two coats and sealed with a glossy topcoat. Lobelia can be described as a dusty deep blue linear holo. Another shade that really feels unique, I don't own anything quite like it. It has a slight color shift and again a really strong beautiful holo finish. Great formula, smooth application, and dries to a nice shine as well. Shown here in two coats and sealed with a glossy topcoat. 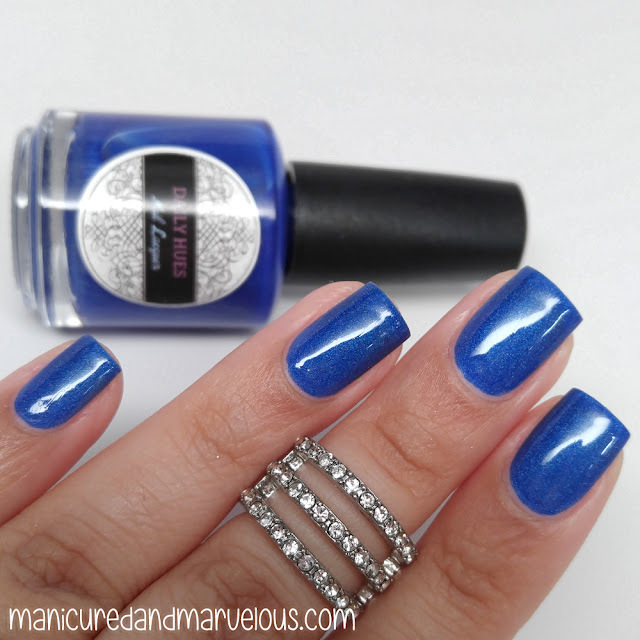 Blake can be described as a bright blue holo polish. This is another comeback polish from earlier on in the Daily Hues line now being brought back in holo form. I'm actually still wearing this beauty about a week later! It has a similar application to Rose, super smooth and opaque. Best of all, no staining! Shown here in two coats and sealed with a glossy topcoat. Morning Glory can be described as a duochrome / shifty base of blue and purple with teal holo hex glitters. Another favorite, but really I doubt I needed to even say that. This shade is magic in a bottle! Great formula and consistency throughout. Can be worn over a darker color or on its own. Shown here in three coats and sealed with a glossy topcoat. Hydrangea can be described as a matte lavender and sky blue hex glitter with iridescent blue glitters. I adore this glitter combo, but I do think it would be better suited over a base. The consistency can be a bit on the thick side and can clump if you do a third coat on its own. My recommendation would be one coat over a base. Shown here in two coats and sealed with a glossy topcoat. Geranium can be described as a deep purple with navy blue holo hex glitter. The color to glitter combination along with the shimmer gives this one the slight illusion that it's textured. The finish is smooth though with the glitters well dispersed. Shown here in two thin coats and sealed with a glossy topcoat. Petunia can be described as a greyish lavender pearl finish color. The pearly finish makes the application a little bit troublesome and I found the consistency a bit on the thick side as well. To minimize the brush strokes I sponged on a third layer. Shown here in three coats and sealed with a glossy topcoat. Angelface can be described as a royal purple holographic polish. Of course, this purple beauty is another favorite of mine. The consistency is really opaque, practically a one coater. Shown here in two thin coats and sealed with a glossy topcoat. And that's it guys, hope you made it through that storm of photos haha. Such a large, but gorgeous spring collection right?! Overall I am amazed at this collection and honestly don't know what to praise first. But I guess I should mention the negative first and I didn't care for Petunia. It had a difficult application for me and I just never find myself to be a fan of pearly finishes. That single one aside, the other 13 shades in this collection are flawless. So many favorites. The formulas though are definitely the main selling point for me with these. A lot of the holos were so opaque in a single coat that the second was barely needed. And the glitters were so diverse, love the fact that they can be worn with and without undies. But I'd love to hear what you guys think, let me know which one was your favorite! As I've mentioned earlier, the Blurple Garden Collection from Daily Hues Lacquer will be available for purchase March 1st. Currently there is a pre-sale available for those interested in purchasing the entire collection for a discounted price. On release, each polish will retail between $8.25 to $11.50 per full-size. Lots of pretties, but Pansy surprisingly is what catches my attention the most. It is so different from anything I've seen before! Gorgeous swatches! The must haves for me are Lily of the Nile and Blake (H). These are beautiful!! I'm hoping the flu is out of our house so I can go back into my polish room next week to get these done. She did a phenomenal job with this collection! Six of these are on my wishlist! I am not a blurple lover but Pansy and Rose are right up my alley! So many pretties!!!!!! My eyes can hardly take it!! There definitely are some polishes in this collection I wouldn't mind getting. Holy Molly 14 polishes!? Lol.